Following the arrivial of the BlackBerry Passport, the Canadian company is readying another handset, believed to be called the BlackBerry Classic. 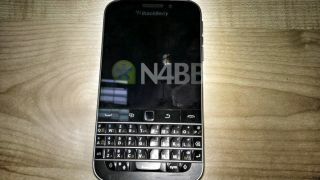 Courtesy of a report from BlackBerry-watchers N4BB.com, we've got our first look at the device (pictured above) as well as a bunch of rumoured internal specifications. The Classic is, as you would guess, much more vintage BlackBerry than the square-shaped Passport. The five-button navigation belt is back, and the keyboard boasts four rows over the Passport's three. According to the report, the belt buttons will be clickable, with the possibility of haptic feedback - although it's apparently unlikely they'll be illuminated. Other specs include a 1.5GHz dual-core MSM 8960 S4 Pro processor with Adreno 225 GPU and 2GB of RAM. Storage is limited to 16GB and the on-board cameras consist of 8MP round the back and 2MP at the front. The 3.5-inch LCD screen boasts a 720 x 720 resolution and 294 ppi. These are lean years for BlackBerry but the company rode a wave of publicity with the curveball that was the Passport. Now though, it seems something more conservative is in order and word has it that the Classic could be ready in time for a November release. BlackBerry Passport - a return to form?